Serenata is a professional solo harpist and a musical ensemble that performs for weddings, parties and social receptions. Our musical styles range from classical to sacred to pop, folk, and Broadway. We have received rave reviews for our inspiring musical performances from brides on their wedding day to congressman and governors celebrating political victories. Harpist Jan Holland, long considered one of Washington-Baltimore-Annapolis' finest musicians, leads Serenata. 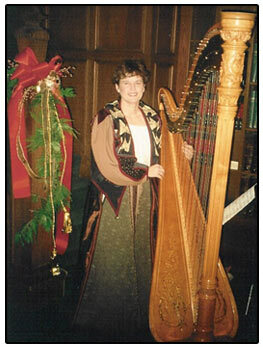 Jan performed as principal harpist for 20 years with the U.S. Army Field Band, America's musical ambassadors to the world. As a professional musician, she has performed in musical settings such as the Maryland state capitol, the Russian Embassy in Washington, DC and the American Embassy in New Delhi, India. In addition to her work as a soloist, Jan moves easily within a great variety of musical configurations such as harp and violin or flute, harp and cello, harp and string bass or harp and trumpet. She also accompanies vocalists. The harp, in and of itself, is truly a work of art and is one of the most visually and acoustically beautiful instruments in the world. Its enhancing tones provides tranquility and grace. Serenata enhances any musical event and creates an elegant atmosphere for those who have them as a part of their special occasion.